According to the Smithsonian Science Education Center, 78% of high school graduates don’t meet the benchmark readiness for college courses in mathematics, science, reading, or English. So in 2009, Barack Obama, former President of the United States, launched the “Educate to Innovate” campaign to help and challenge the students to excel in Science, Technology, Engineering, and Mathematics (STEM). He believed that STEM and computing skills are necessary, especially for American students, to maintain America’s lead in the world’s technology in the future. The evolution of technology created a significant shift in our lives today and certainly, in our future—that’s why it’s no wonder that 90% of parents want their children to learn how to code, according to Code.org. 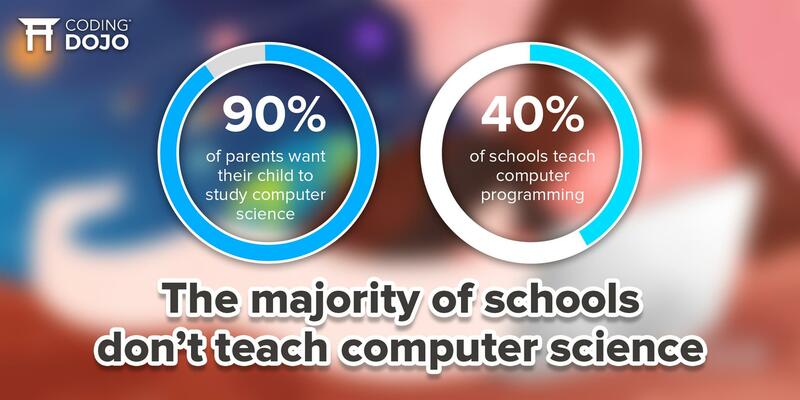 Unfortunately, only 40% of schools teach computer programming. To better prepare for the future, we should invest our time and our effort to teach our children how to code. But the question is: If most of the schools don’t teach our children how to code, who will help them appreciate the significance of coding in their lives? Our parents taught us how to walk, to read, to count and to write. But to compensate for the insufficiency of curriculum and instruction in coding, parents should also equip themselves with skills like coding, critical thinking and problem-solving. We can’t teach something we don’t know. So before we can teach our children skills like coding, we must first learn how to code. Computer programming can be a little intimidating especially for people who don’t have a background in information technology. But to answer the question if it’s possible, the answer is YES! It will be hard, but it is possible. Take the example of Wendy Zenone. She was thirty-eight years old and has three children to take care of when she began learning how to code. She made use of her limited time to practice coding every day. Looking back, she can’t imagine how she managed to learn how to code with that kind of responsibility on her shoulder, but she made it. Now, Wendy works at Netflix as a senior security engineer. You don’t have to compare your worst to someone else’s best. It’s so easy to belittle yourself and doubt your abilities, but sometimes, your doubt means you’re in the right direction. It means that you’re ready to grow and learn. Take one step at a time, even if it means slow progress. You have to be patient with yourself, no matter how frustrated you may become. Don’t get discouraged when you forget common functions or basic syntax. No one expects you to memorize everything. Google exists for a reason. It has almost everything we need to know. Don’t throw yourself words of criticism because of the mistakes you make. You’ll never know the answer if you don’t ask the right questions. Asking does not mean you’re unintelligent; it only means you’re willing to learn. There are great sources of information on the web where you can go to such as Stack Overflow, Quora and other forums where you can interact with other developers, both experienced and a newbie like you. There is no better teacher than the people who have been at your place at some point in their lives. Make time to get to know other parents like you who are also learning how to code. Scratch.com, an online community where people share their experiences and ideas, and other online communities can help you become more motivated in learning how to code. Don’t ever think that there’s no time to code because there is. Make a goal to find ways to code every day. Put coding in your priority list, and you’ll begin to see your progress. Aside from the people you will get to know on the internet, it is also important to have someone you can ask for help in person; a coach or a mentor, for example. You need to find someone who is patient; someone who knows how to help you solve problems on your own and who can motivate and inspire you to become the best programmer you can be. A Coding Bootcamp is a short and intensive training in programming that will help you become a self-sufficient developer regardless of your educational background. Imagine being a self-sufficient developer in fourteen weeks. Sounds impossible right? But you heard it right. The instructors in Coding Dojo will help you overcome the challenges you may encounter and focus on the important aspects and practices of coding. You will also have the chance to work with other people who have the same goal and skill set as you, and as a result, you’re making your connections wider, creating a bigger chance of employment or career change in the future. Coding Dojo is the only bootcamp that teaches three full-stacks and six of the most in-demand programming languages in fourteen weeks. For parents who can’t attend our onsite bootcamps, an online bootcamp where you can code part-time and from home is also available. If your goal is to become a self-sufficient developer in a short amount of time, you can visit our website to learn more. Some of the famous and successful programmers in history learned how to code early in their life. Jack Dorsey, co-founder and the CEO of Twitter, for example, taught himself to program and completed his first dispatch routing software at the age of thirteen. As Douglas Rushkoff once said, “Code literacy is a 21st-century requirement for participation in a digital world.” Coding is a must-have skill to be employed into the jobs of the future. 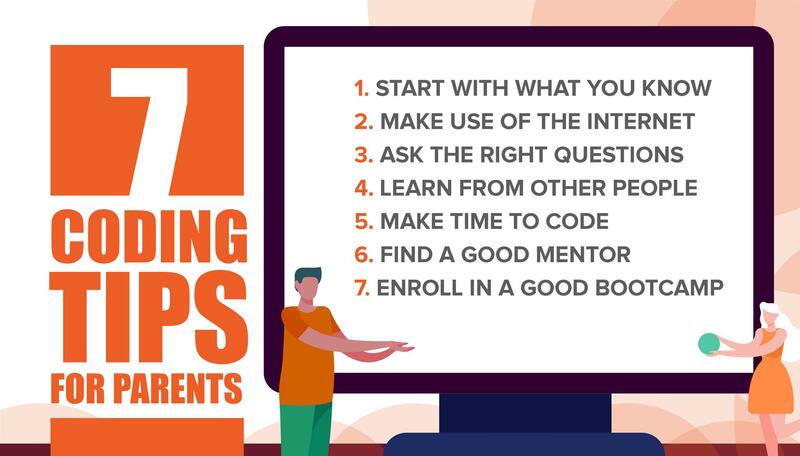 As parents, learning how to code is a career move that would benefit not only you but also your children. You can’t connect the dots moving forward, but who knows, your son or daughter might turn out to be the creator of the next big thing in the web.